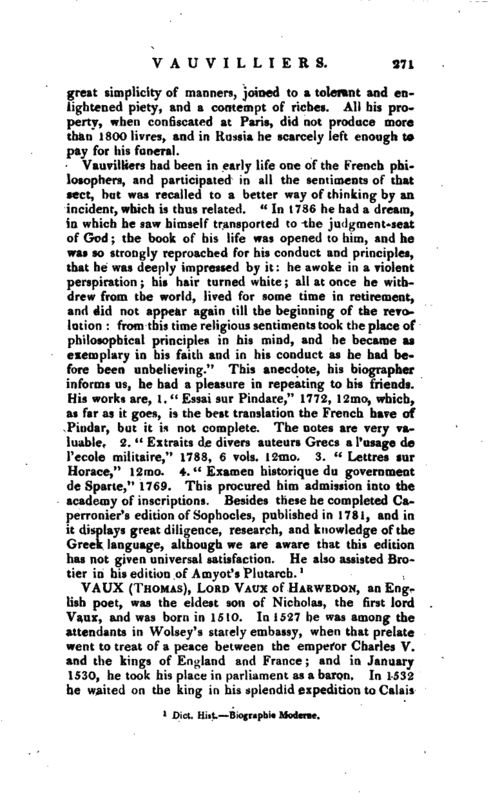 , a French writer of considerable talents, was the son of John Vauvilliers, professor of rhetoric in the university of Paris, and of Greek in the royal college, who is known to the learned world by several Latin dissertations, particularly one “De praestantia Grsecarum literarum,” &c. He was born about 1736, and applied so diligently to his studies that he was able to assist his father in his rhetorical lectures. 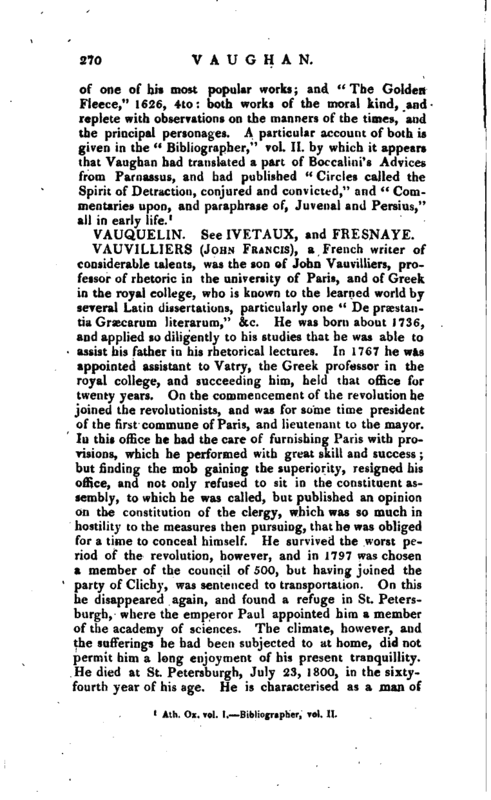 In 1767 he was appointed assistant to Vatry, the Greek professor in the royal college, and succeeding him, held that office for twenty years. On the commencement of the revolution he joined the revolutionists, and was for some time president of the first commune of Paris, and lieutenant to the mayor. In this office he had the care of furnishing Paris with’provisions, which he performed with great skill and success; but finding the mob gaining the superiority, resigned his office, and not only refused to sit in the constituent assembly, to which he was called, but published an opinion on the constitution of the clergy, which was so much in hostility to the measures then pursuing, that he was obliged for a time to conceal himself. He survived the worst period of the revolution, however, and in 1797 was chosen a member of the council of 500, but having joined the party of Clichy, was sentenced to transportation. On this he disappeared again, and found a refuge in St. Petersburgh, where the emperor Paul appointed him a member of the academy of sciences. The climate, however, and the sufferings he had been subjected to at home, did not permit him a long enjoyment of his present tranquillity. He died at St. Petersburg, July 23, 1800, in the sixtyfourth year of his age. He is characterised as a man of | great simplicity of manners, joined to a tolerant and enlightened piety, and a contempt of riches. All his property, when confiscated at Paris, did not produce more than 1800 livres, and in Russia he scarcely left enough to pay for his funeral.